New tool will boost coordination between lakes: try out the interactive map! 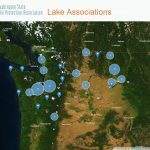 Washington State Lake Protection Association (WALPA) helps lake associations and watershed stakeholders coordinate and cooperate to protect lakes. 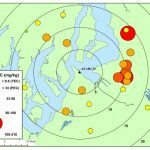 To support this mission, the Center for Spatial Information and Research (CSIR) in Central Washington University’s Geography Department has partnered with WALPA to develop a Web-based interactive map of active lake associations in Washington and Idaho. Harmful algae blooms are on the rise – help us track related illnesses! Has your lake experienced more algae blooms in recent years? You’re not alone. Washington is one of many states experiencing increased harmful algal blooms (HABs) in lakes, ponds, streams and rivers. 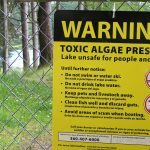 Since HABs are an emerging public health issue, state and local health jurisdictions (LHJs) are concerned with toxic blooms, as are lake managers, lake residents, and those who use lakes for recreation. In Washington, liver toxins called microcystins are most prevalent; around 100 types are currently known. The next most frequently observed cyanotoxin in our state is anatoxin-a, a nerve toxin. I have had a life-long fascination with the microscopic world in freshwater lakes and streams. As a child I loved to collect samples from the local “ditch” to look at using my student microscope (best birthday present ever!). 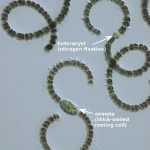 I took my first algae class in 1973 from Gerry Prescott, and it changed my life. What I have learned in over fifty years of study is that the microscopic world contains an astonishing ecological complexity. 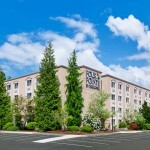 WALPA heads north to Bellingham this year to host its 29th annual conference. This year’s theme is “Lakes – Reflections of Change.” Please join your fellow lake lovers at the Four Points by Sheraton Hotel and Conference Center to share the latest in lake research and science and lake management topics through talks and poster sessions. While the conference focuses on change, we invite you to submit abstracts on a wide variety of lake-related topics. By Jim Gawel, Ph.D., Anthony Endresen, Erin Hull, Amina Kedir, and Corey King, Rebecca Neumann, Ph.D., and Pam Barrett, Ph.D.
Arsenic, a priority Superfund contaminant, neurotoxin and carcinogen, is a ubiquitous contaminant polluting many urban surface water bodies. (A majority of Superfund sites are located in densely settled areas and 139 sites have arsenic-contaminated surface waters.) However, the human health and ecological implications of this contamination are unclear due to an incomplete understanding of arsenic bioavailability in urban waters, which are typically affected by eutrophication.